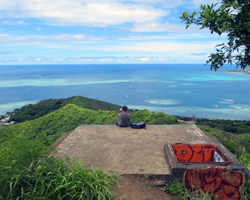 Puu Maelieli Trail: a Steep Climb for the Best View of Kaneohe Bay. 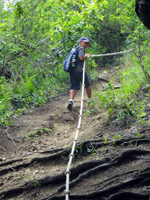 Puu Maelieli Trail: Most Beautiful Hike in Hawaii! I didn’t know the name of the Puu Maelieli (pronounced: Poo-ooh Mah-elly-elly) trail until I hiked it for approximately the tenth time, in May 2013. My family always just called it the trail along the top of the ridge behind my parents’ house. Regardless of what you call it, if you can go there on a cloudless, vog-less, ultra-clear day (somewhat rare in Kaneohe), this trail is quite likely the single most beautiful scenic hike in Hawaii! 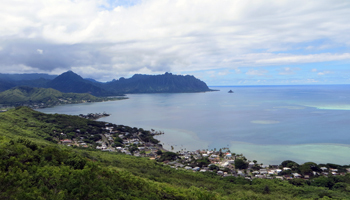 From the 700-foot summit of the Puu Maelieli trail, you’ll get an unobstructed 220-degree view of Kaneohe Bay (see panorama at bottom). On a perfect day, in its absolute most-gorgeous state, this hike is worth cancelling your other plans. I mean it! The sights and the colors are breathtaking – even for local residents! Heck, I grew up across the street from Kaneohe Bay, and I still do this hike just for the view. Furthermore, if you’re someone who takes the time to appreciate the diversity of flowers and trees, you’re sure to enjoy the path as much as the destination. I wouldn’t normally identify something as the most beautiful in Hawaii – especially when it could sound like I’m pimping my parents’ back yard; but I didn’t make this statement. In June, my mom took her hiking buddies on this trail for the first time. Her friends have hiked all over Oahu, and they said Puu Maelieli is unequivocally the most beautiful hike anywhere on the island. In fact, they liked it so much they were talking about going back the next day! I just happen to agree with them. Update: because what started as a perfect day in May quickly clouded-up (and even started raining) as soon as I arrived, I felt that the pictures on this page didn’t begin to accurately reflect this trail’s beauty. Well, in July I was back out at my parents’ house again preparing to go do a waterfall hike with my dad and my nine-year-old son, but the weather was so perfect that I followed my own advice and cancelled that plan to go hike Puu Maelieli again. I didn’t quite beat the afternoon clouds, but it was gorgeous nonetheless! My son had no trouble with the trail, and he loved the view. It was so worth it! According to the trail marker sign (oddly located at the top of the ridge and not at the trailhead), Puu Maelieli means “Digging Hill”. The name is based on a story from Hawaiian mythology in which the gods Kane and Kanaloa raced to the top of the hill, and because the slope is so steep, they had to dig in with their hands to climb it. That tells you pretty much everything you need to know about this trail. It seems like the entire 2.5-mile length (one way) is one 45-degree slope after another… up… down… up again… down again. You’ll be clutching onto branches and roots and whatever you can get your hands on while scrambling along these inclines. Nevertheless, my 70-year-old parents have joined me for this hike, and they weren’t even the oldest people on the trail. We crossed paths with one party of 80-year-olds! They weren’t fast, but they were happy to be there. As for me, I noticed that the hike seemed a bit more difficult than when I was a kid, but the only pain I suffered afterward was one blackened toenail (from banging into the front of my shoe on the downhill slopes). At this point, I’d like to give credit to the unknown group that has been maintaining the Puu Maelieli trail recently. When we hiked it in May 2013, it was obvious that several limbs and obstructions had been freshly-cleared. When my son and I went again in July, a brand-new knotted rope had been permanently installed on one of the steepest sections of hillside; and other improvements were also visible. Thank you, mystery menehune. The trailhead is located near the corner of Hui Iwa Street and Kahekili Highway in Kahaluu (across from Koolau Center and Valley of the Temples Memorial Park). You’ll want to park on Hui Iwa Street and then walk in the uphill direction along the left side of Kahekili Highway until you come to a narrow trail (directly behind the townhomes). If you need snacks or water or sunscreen or a bathroom break, make sure you stop at one of the many shops or restaurants in the Koolau Center before going to the trail, because this will be your last chance for a while. 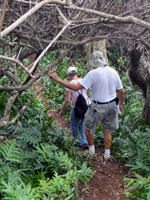 Much of the Puu Maelieli trail is well-shaded by thick overgrowth. In fact, you’ll find yourself passing through numerous tree tunnels. 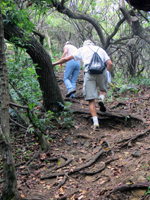 This is nice, because it should keep you cooler than many other Hawaii hikes. But that doesn’t mean you can neglect the water and sunscreen. You’ll still need both. 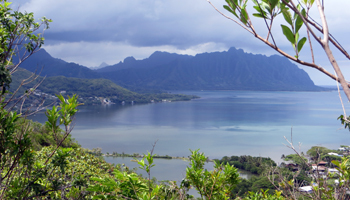 The trail runs almost the entire length of Heeia State Park (the unmaintained portion) along the top of a short ridge that skirts the shore of Kaneohe Bay. And there are two possible end-points in vacant lots off of Lulani Street. However, since you’re not trying to get to my parents’ house, you may want to just hike to the bunkers at the summit and then go back the way you came. 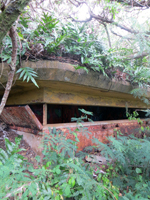 The bunkers were constructed during World War II as part of the Camp Heeia combat training area. The first bunker you come to is overgrown by trees, and the trail runs right across the top of it. Just be careful not to fall in the open pit of an entryway. Don’t get too excited about the first bunker, because the next one offers the million-dollar view! From the vantage of this second bunker, you’ll see almost the entire expanse of Kaneohe Bay (simply amazing on a perfectly clear day), Heeia Kea Pier (featured in the film 50 First Dates), Heeia fish pond, Marine Corps Base Hawaii Kaneohe Bay, Coconut Island (featured in the title shot of Gilligan’s Island), Chinaman’s Hat, the Kaneohe Bay sandbar, and more! For you LOST fans, the jungle directly below you is where the cockpit of the crashed airliner and related jungle scenes were filmed. Oh, and Kaneohe Bay itself is where the most recent Pirates of the Caribbean movie shot most of the scenes involving the Black Pearl at sea. In short, there’s plenty to see; so make sure you have time to sit and enjoy it all. 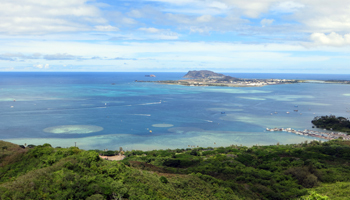 The only part of Kaneohe Bay that you can’t see from the bunker at the summit is the Kahaluu fish pond (featured as the Okinawan village in Karate Kid II). 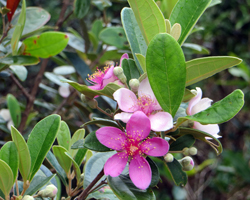 You’ll have to hike almost to the end of Puu Maelieli trail in order to see that. One final note: your chances of getting an absolutely perfect cloudless day on this part of the island are somewhat slim. It’s the cloudier side of the island. That can’t be helped. So don’t let that stop you from enjoying this hike. Just cross your fingers and pray for good weather. Then enjoy whatever conditions you get. Disclaimer: Stupidity and carelessness can kill you. Use your brain and take responsibility for your own safety. Know the limits of your ability and stay within them. Watch your kids like a hawk. Heed posted warning signs. Take this guidance, mix it with your own good judgment, and live to enjoy the rest of your Hawaii vacation!